was a Spanish-Catalan painter, sculptor, and ceramicist born in Barcelona, Spain. His artistic training was in Barcelona;later in Paris; he worked in both of these two cities. Earning international acclaim, his work has been interpreted as Surrealism, a sandbox for the subconscious mind, a re-creation of the childlike, and a manifestation of Catalan pride. He was associated with Picasso and took part in the Surrealist exhibitions. 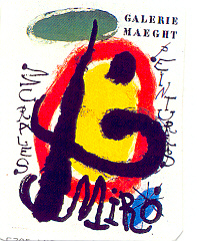 This page shows "Miro" styled Venetian Glass Beads made in honor of, and paying homage to the artist Miro.